Returning home to take care of his ailing mother, Cam Stewart reunites with his best friend's little sister. And while Erin Kinley is still a firecracker, she's grown from an annoying tagalong to a beautiful woman and devoted foster mom. She and Cam still drive each other crazy...until Erin turns to Cam for comfort during a stressful adoption process. Cam's fractured family had him convinced he'd never be a dad, but suddenly he's considering two things he never thought he would: having a family and staying in Oaks Crossing. Could Erin and her son be everything he's longed for? 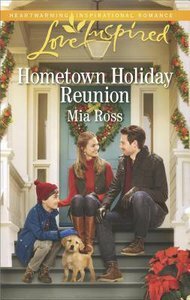 About "Hometown Holiday Reunion (Oaks Crossing) (Love Inspired Series)"